Discussion in 'Online Games - News and Reviews' started by Ellis, Jul 8, 2010. 3 Brand New Microgaming Games to be released. Microgaming has a new update Ready for its Clients. This Update will bring 3 fantastic Brand New Microgaming Videoslots! The New Games will be available around the end of June 2010. Lets have a look and prepare ourselves! 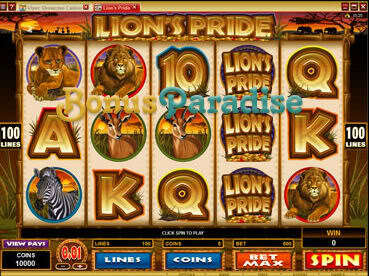 stacked Wilds, Free Spins with massive Multipliers and a world class Gamble feature. Play with a little 0.01 up to 10.00… hit rewards of 12,500 on the base game – and rake in up to 125,000 with Free Spins. Keep a eye on the Tribal Masks… hit three and get Free Spins with multipliers ranging from 2X to 10X. You’re also treated to plenty of Shanghai surprises with a glorious range of Free Spins, Multipliers and three different Scatter symbols. five massive multipliers... the biggest of which being 100X. Absorb yourself in the state of the art game play and experience an eclectic array of Scatters, Wilds, Free Spins, Multipliers and more. three-stage golf tournament… Here you get to harness the power of one of five epic golfers – and play through this bonus tournament like a seasoned pro on a quest for a big payday. Each time you hit the bonus, your golfer moves on to the next hole of the exclusive Argyle course. Trigger the Drive and Fairway Bonuses to receive re-triggering free spins. 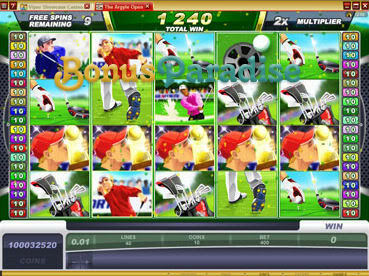 Score a hole in one and get 20 Free Spins with a 5 TIMES multiplier. Nice new Slots from Microgaming! I like the Lion's Pride, and the Agyle Open looks interesting too! Palace Group Casinos run a nice promo, you get quadruple loyalty points for your play on the new slots. I like the Agyle Open Slot. Does anyone know if it stores the bonus rounds? One needs three rounds to recieve free spins, what if I log out...do I have to start with bonus round #1 again? I played it, had round one, and next day I continued on this slot and got round 2 and then 3. So it does store it. Yeah goldenhorse, the games are awesome! Have you tried them out already?